New Delhi: The recent violence in Bulandshahr that claimed the life of a policeman and a 20-year-old man was a "selective attempt" to "instill fear" in the Muslim community, an umbrella organization of human rights organizations that appeared on Sunday and demanded a Supreme Court. Probe monitored in it. 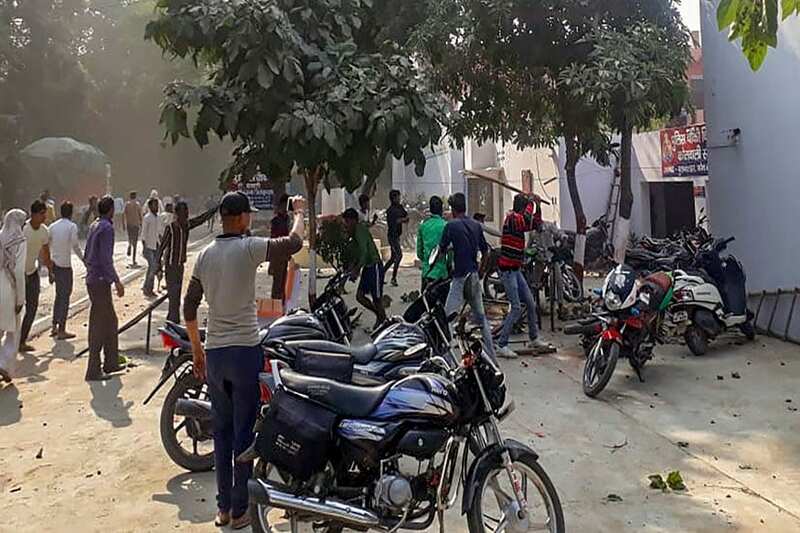 Inspector Subodh Kumar Singh and civilian Sumit Kumar from the village of Chingrawathi were killed on 3 December in mob violence that broke out in the Siyana area of ​​Bulandshahr after livestock carcasses were found scattered outside the village . The incident occurred when the electoral process in five states, Madhya Pradesh, Rajasthan, Chhattisgarh, Mizoram, Telangana, was under way. Hindutvawadi forces devised the incident to "polarize" voters because of "ongoing elections in five states," said the organization, whose members visited Bulandshahr and presented a report of the "fact-finding" committee here, and demanded a new law to review hate crimes. The National Confederation of the Human Rights Organization (NCHRO) called for an immediate ban on all groups and "signs" that use weapons "in the name of protecting cows." Addressing media in the Press Club here, NCHRO members claimed that the violence was a "planted incident" to create riots in the area and elsewhere "on behalf of the cow." "The Mafia, at the behest of local leaders Bajrang Dal and BJP Yuva Morcha Yogesh Raj and Shikhar Agrawal, met at the Chingrawathi police post and burned many vehicles, organized a shootout and threw stones at the police force," he said. a statement. declaration. The member of the "investigation" team, Manoj Singh, of the All India People's Forum, said that the way in which an alleged video of the inspector's murder was filmed "clearly indicates" that the mafia received political protection. "In a peaceful area like Bulandshahr, the December 3 incident was an attempt led by the Sangh-BJP organizations to instill fear in the Muslim community," Singh said. He said that small skirmishes between local groups were used as an excuse to start communal clashes. "There are clear signs of political conspiracies at work to discourage honest members of the administration, such as Inspector Subodh, through intimidation and fear of life," he said. He said there were also no signs of cows being slaughtered in the fields outside the village of Mahaw, where the bodies were found on December 3 in the morning, "which makes it clear that the violence of the Mafia … was executed through meticulous planning. " The NCHRO also noted that several innocent people, including two minors, were put behind bars, while the key suspect, Bajrang Dal's local leader, Yogesh Raj, was still at large. "A law must be made to contain the violence of the Mafia and an immediate ban on all organizations and organizations that use weapons and have led the country to a civil war situation in the name of protecting the cows, "said NCHRO. "Another law will also be enacted and will be implemented strictly to guarantee the state government's responsibility to control hate crimes and the elements that propagate hate crimes," he said. The Ministry of the Interior should periodically review it and share details in each parliamentary session on the steps it has taken to control riots and hate crimes, Singh said. Another team member, Ansar Indori, said the incident was a "planned affair." "The occurrence of such a large incident in the presence of the government shows that it was a planned issue, the presence of the police prevented the violence from spreading further, the murder of a police officer at the hands of the mafia occurred while he was executing his duties, "Indori, a lawyer by profession, told reporters. Meanwhile, Sarfuddin, a resident of the village of Nayabans, who was initially arrested by police after a complaint from Raj, told reporters that he was going to file a judicial appeal against his arrest. He was arrested under sections 358 of the Criminal Code of India (assault or criminal force for serious provocation) and 295 (wounding or desecrating the place of worship with the intention of insulting religion of any kind), but was released after 16 days . "I was imprisoned for 16 days when I had not done anything, I am the chairman of the village mosque committee and they named me as a conspiracy," he said. Sarfuddin, who runs a clothing store in the city of Siyana, also claimed that a leader of a local right-wing group was threatening him and that he opposed the installation of the loudspeaker in the mosque in 2017. Seven people, two children aged 11 and 12, a non-existent man, a man who lives in Faridabad for more than a decade, in addition to Sarfuddin, were named in the FIR for cow slaughter in a complaint from Raj. Police recently arrested three men who were not named in the FIR for their role in the alleged massacre of cows on December 3.